The Berkley Gulp Jerk Shad fishing lure has revolutionised the soft plastic scene and this 5 inch model is one of the greatest Snapper soft plastics ever produced! But it doesn’t stop just with Snapper! The Berkley Gulp Jerk Shad will absolutely smash almost any reef species including Yellowtail Kingfish, Coral Trout, Amberjack, Sampson Fish and all Trevally species. The Berkley Gulp Jerk Shad has also accounted for some pretty impressive game species including an array of Tuna species, Dolphin Fish and even Mackeral. If the offshore reef fishing isn’t your scene the Berkley Gulp Jerk shad is also highly productive in the estuaries for species such as Mulloway, Flathead and Mangrove Jack and from the ocean rocks they are fast earning their place for chasing Bonito and Australian Salmon. The Berkley Gulp Jerk Shad soft bait fishing lures come soaked in the famous Gulp scent that has proven to be irresistible to fish and will tempt even the smartest of fish into striking! 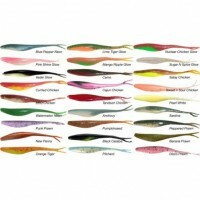 The Berkley Gulp Jerk Shad soft plastics are 5 inches long and there are 5 plastics in a packet. The Berkley Gulp Jerk shad fishing lure can be bounced of the reef floor or lightly fed back through a berley trail or even cast into wash around rock platforms and break walls. Whatever way you decide to fish them they always seem to find their mark! Berkley Gulp is 100% biodegradable and made of 100% natural ingredients. 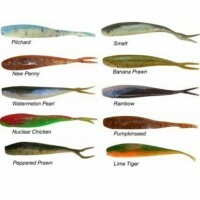 Berkley Gulp releases 400 times more scent than other plastic baits. Berkley Gulp Jerk Shads are available in a huge range of colours. Berkley Gulp soft plastics are environmentally friendly so if you lose a plastic you’re not damaging the environment. Berkley Gulp Jerk Shad soft plastics come in proven productive colours and come soaked in the famous Gulp scent that sends fish into a feeding frenzy. Berkley Gulp Jerk Shad comes in a handy resealable bag and includes 5 soft plastics all 5 inches in length. Berkley Gulp Jerk Shad fishing lure is famous amongst Australian anglers for its unmatched ability to nail the mighty Snapper! The results speak for themselves! 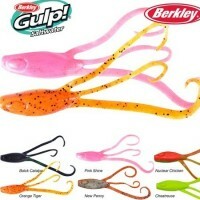 Purchase some Berkley Gulp Jerk Shads and see for yourself what all the fuss is about! The Berkley Gulp Minnow soft bait fishing lure is one of the most popular soft plastics on the market and for good reason, it works! The Berkley Gulp Minnow fishing lure is without a doubt one of the most effective and most revolutionary artificial soft baits ever invented. The Berkley Gulp Minnow fishing lure is an absolute must for any estuary fisherman and if you love chasing fish on plastics then the Berkley Gulp Minnow soft bait fishing lure will make your day! This particular Berkley Gulp Minnow fishing lure is 4 inches in length and has an irresistible action that just simply catches fish. Berkley Gulp Minnow fishing lures are extremely effective when chasing species such as Bream, Flathead, Trevally and many other estuary species and are great for targeting Snapper and other reef species. The Berkley Gulp Minnow fishing lure has also proven itself on Bass and other perch species and is even popular on Trout. With 8 lures per packet the Berkley Gulp Minnows are excellent value for money and their results will have you pleasantly surprised! The Berkley Gulp Minnow soft bait fishing lure is inclusive of the famous Berkley Gulp scent that has proven irresistible to fish and really sets this lure ahead of other soft plastics. The resealable packaging ensures your soft plastics are always fresh, soft and scented ready for use for long periods of time. The Berkley Gulp Minnow is 4 inches long making it the perfect bite size offering for all estuary species as well as freshwater Bass and Trout and with each package containing 8 lures it really is excellent value for money. The Berkley Gulp Minnow is 100% Biodegradable meaning you're doing the right thing for the environment when choosing this fantastic lure.The Berkley Gulps scent is 2nd to none and puts out 400 times more scent than other plastics meaning more bites! The Berkley Gulp Minnow is a must have for any estuary fisherman and has been a standout go to lure for years. Grab yourself a packet today and watch them perform beyond your expectations! The Berkely gulp for inch Minnow fishing lure is a must to your tackle box. Ideal for reef fishing and work up fishing the Squid Vicious can be dropped down on the reef with an appropriately sized jighead and kept in the strike zone for extended periods. Testing has proven snapper and kingfish find it hard to resist the waving arms of Squid Vicious. -Specifically designed for reef fishing for snapper, kingfish etc. -Can be used a static bait – long cast and let it free fall to the bottom. -Use as a jig style vertically, but be ready for bites on the drop as the leg action makes predatory fish hit hard. -Like all GULP baits, it is water based and bio-degradable.